Laser Tag Xmas Party in Glasgow only £11pp! For a memorable, exciting and exhilerating Christmas Party with your work, sports or social club, family and friends, have a blast at Lazer Planet. If you are looking to do something different this year we provide an ‘out of this world’ setting where you can battle it out with your friends, just like being in ‘Star Wars’ or ‘Star Trek’ for real! 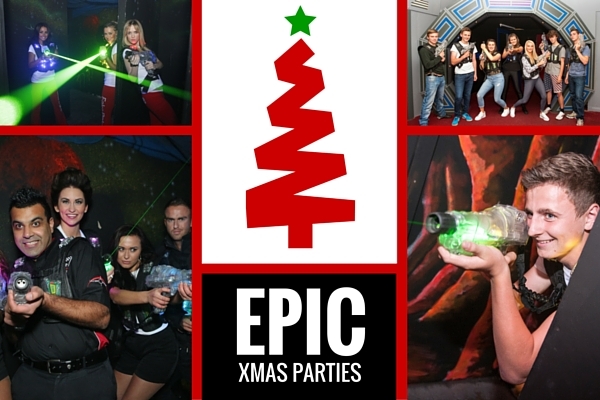 Book an epic laser tag Xmas party in Glasgow only £11pp for 3 thrilling games lasting 20 minutes per session. Play a ‘Solo’ game to see who is your hot shot, a ‘Team Game’ and ‘Team Game with Bases’ where you have to protect your base and try to attack your opponents. Accredited youth groups can benefit from further group discounts. Up to 30 players can battle at once in 2 or 3 teams, and larger groups can also be accomodated easily. Great value pizza buffets are avialble in the VIP party rooms, and adult groups are welcome to bring wine and beer for after their event. Multi activity afternoons or evenings are also available as Lazer Planet shares it’s location with ScotKart Indoor Karting in Clydebank www.scotkart.co.uk , and a double ‘Track Drive Karting Experience’ starts from only £22pp. If you are organising an event for corporate entertainment, football club, youth group, rugby club, scout group, boys brigade this Christmas in Glasgow please call us now on 0141 641 0222 and get ready to set your Phazers to fun!